via GoogleMapsMania: Google’s Population Explorer-TRY THIS! Population Explorer is a Google Maps based tool that can estimate the population of any area on Earth, down to an area of 1km2. Draw a polygon anywhere on the Earth and Population Explorer will provide an estimate of the population within the defined area. I’ve tested the tool by selecting areas that I know, such as London and the UK, and I’ve also tested it by searching for estimates in deserts and the sea. From my limited testing Population Explorer does seem to return accurate population estimates. The results of each search displays the total population, the population density, the number of males & females, the age structure of the population and population growth estimates. It’s no secret that the U.S. is one of the biggest carbon emitters around. Households in the U.S. alone are responsible for 20% of greenhouse gas emissions, even though they account for just over 4% of the global population. But which areas in the U.S. are contributing the most? These interactive maps from the University of California, Berkeley show where the U.S. has the biggest carbon footprint. 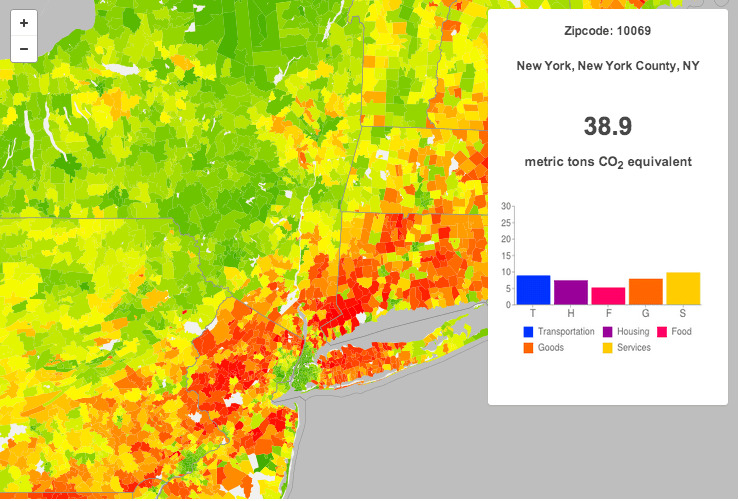 You can even calculate your city’s carbon footprint on their site. The carbon footprint measurement equals the total greenhouse gas emissions of the zip code in question. An area’s carbon footprint includes things like energy people use at home, energy used by businesses, and transportation. The biggest source of emissions depends on the area. For example, the suburbs have a higher percentage of emissions coming from individual vehicles than big cities do. The maps use data from the Residential Energy Consumption Survey. The full study was published in December in Environmental Science & Technology. Here you can see the average annual carbon footprint across the U.S. — green is lower and the orange and red areas are higher emissions. The white areas on the map show where survey data was unavailable. Most areas range between 40 to 80 metric tons of carbon dioxide. The Midwest and parts of the northeast are the worst areas. Zooming in on New York City, you can see that as what the study calls a “mega city” its carbon footprint is low relative to its population density. Unlike the map above, this map shows only how much emissions the average home is producing — emissions from electricity and commutes. This map excludes emissions from things like goods, food, and services. 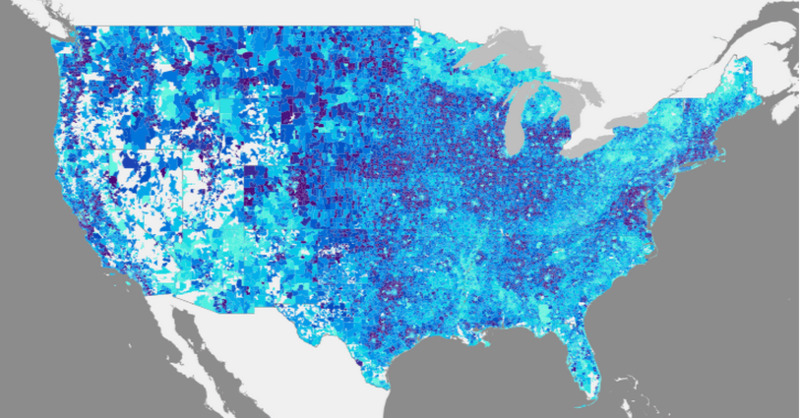 Here you can see the average vehicle miles traveled by zip code. A lot of driving increases the size of a person’s carbon footprint. The purple areas represent the highest number of miles. Intuitively it makes sense to assume that as the population density of an area increases, emissions per person decrease; when people and businesses are closer together, there’s less commuting, and more resources are shared between people. But this new research shows that the relationship is more complex. The study suggests there’s really no direct correlation between population density and greenhouse gas emissions. Emissions actually increase as population density increases until an area hits about 3,000 people per square mile. In mega cities, like New York and Los Angeles, the emissions start decreasing again as the population density climbs. This creates an upside down “U” shape when comparing carbon footprint and population density of an area. 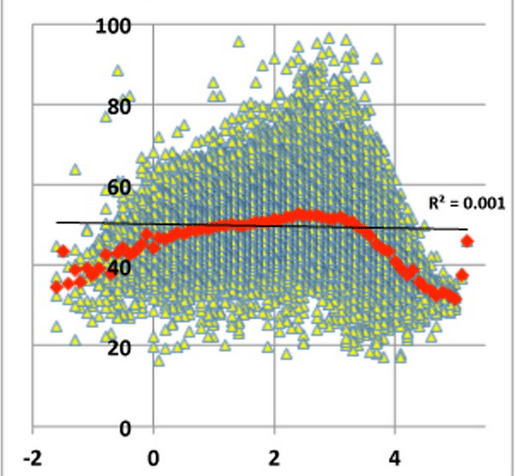 This is visible in the plot to the left, which has population density on the x-axis and carbon footprint on the y-axis. Further, even though these dense metropolitan areas have a small carbon footprint relative to the number of people they hold, the surrounding suburbs have a much bigger carbon footprint, “more than offsetting the benefit of low carbon areas in city centres,” the researchers say. If more people move into the suburbs, there could be a significant increase the country’s carbon footprint. Suburbs already account for 50% of the total household carbon footprint in the U.S.
“Increasing rents would also likely further contribute to pressures to suburbanize the suburbs, leading to a possible net increase in emissions,” the researchers write in the paper. The new insight into how population density impacts carbon footprint shows there is no one-size-fits-all strategy for reducing carbon emissions across the country: Areas with different population densities produce different amounts of carbon dioxide, they also have different main sources of CO2. For example, transportation accounts for 50% of all emissions in suburban areas. But, in big cities like New York, one of the largest emission contributors is food services. The optimal strategy to reduce emissions in both of these areas would be different: the suburbs should focus on ways to reduce transportation emissions, and big cities should focus on ways to reduce food industry emissions.